Lorenz & Lorenz, L.L.P., is a personal injury law firm designed to assist you and your family through the entire personal injury legal process. Lorenz & Lorenz, L.L.P., only accepts injury cases and as such has built their law firm with only one goal in mind: Helping you when you have been hurt by someone's careless, negligent act. What distinguishes Lorenz & Lorenz, L.L.P., from other law firms? 1. Our only office is in Austin, Texas. Many of our competitors have numerous offices throughout Texas. When you hire us you can rest assured that you are hiring an Austin, Texas law firm. We live, work and play in Austin. We have a vested interest in helping make our community a better, safer place to live. You can come in and meet your lawyer and talk about your case at your convenience. This would be close to impossible if our lawyers were jetting back and forth between multiple offices. When hiring a lawyer ask how much time they actually spend in Austin. 2. Accidents are our only business! Lorenz & Lorenz, L.L.P., only accepts personal injury cases. Most of the cases involve injuries from car wrecks and truck wrecks. Since our inception we have only represented people who are injured by someone's negligence. 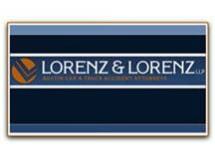 Lorenz & Lorenz, L.L.P., has never accepted a case outside the field of personal injury. This means we are up to date on the latest laws and trends pertaining to injury litigation. Many firms claim they handle personal injury cases but when you start asking questions you may find that most of their cases are in the field of business litigation or family law. If you are hurt, make sure you hire a law firm who ONLY handles personal injury cases. 3. Experience! We have handled thousands of personal injury cases in Austin. Our lawyers have tried over 50 cases. We have represented people who have had minor injuries and families of people who have been killed by dangerous drivers. Make sure the law firm you hire has the experience to help you with your personal injury case when you need it. 4. Respect! Three of the attorneys at Lorenz & Lorenz, L.L.P., were selected as Rising Star Super Lawyers in 2009. Only 2.5% of the attorneys in Texas are Rising Star Super Lawyers. Rising Star Super Lawyers are selected by other Texas Super Lawyers who have personally observed them in action. Many of our clients are injured in car wrecks or truck wrecks and as a result often do not have transportation to come to our office. Knowing this, we are fully staffed and capable of meeting prospective clients at their home or hospital seven days of week with night appointments available. Of course, if you want to come into our office we are more than happy to accommodate your. Once we go through the initial paperwork and the contract is signed, you become our client. At this point we contact the responsible party and begin our investigation. We have a full time investigator on staffs who is trained to conduct thorough investigations into the facts surrounding your car wreck. Many people who are injured are unsure where they can receive treatment for their particular type of injury, do not have health insurance or do not know any doctors in the Austin area. Lorenz & Lorenz, L.L.P., can assist clients by referring them to a doctor for treatment if necessary. Once our clients have finished their treatment and have returned to pre-accident status or have reached their maximum medical improvement following their injury, we gather all related medical records, bills, lost wage information and any other damages that you may have suffered. After we have all of this information Lorenz & Lorenz, L.L.P. 's, assistants assemble this information in a packet for review by one of our attorneys. All cases at Lorenz & Lorenz, L.L.P., are negotiated by a qualified attorney, not a legal assistant. Most cases settle during the negotiations phase. However, if your case does not settle rest assured that when you hire Lorenz & Lorenz, L.L.P., you are hiring are fully capable law firm that will take your case all the way to trial if necessary. You can rest assured that when you hire Lorenz & Lorenz, L.L.P., your case will be handled by professionals who know the law and will fight to make sure your rights are protected.